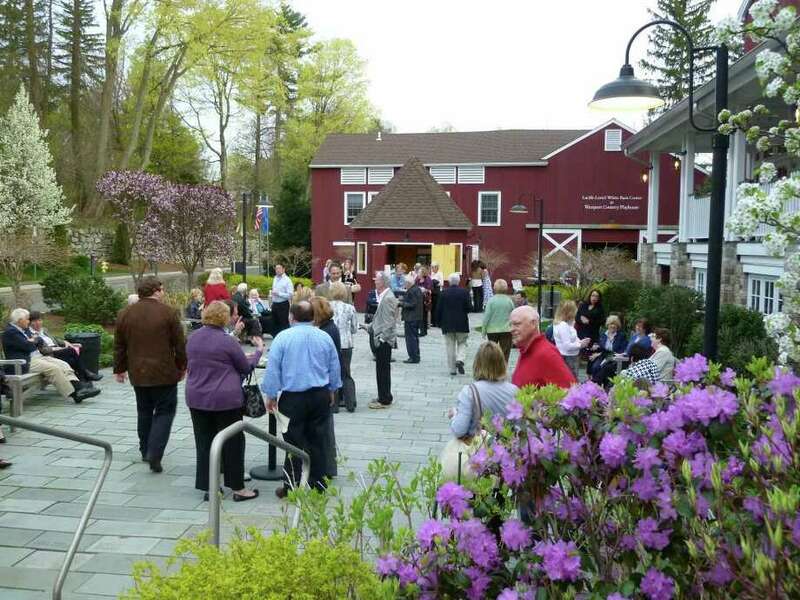 "Taste of Tuesday" attendees mingle in the courtyard outside the front entry of the Westport Country Plahouse. A mix-and-mingle that has become a new tradition at the Westport Country Playhouse kicked off a season that shows great promise. Held early evening Tuesday in and about the Lucille Lortel White Barn Center at the playhouse, 25 Powers Court, "Taste of Tuesday" treated 400 subscribers to wine, sushi and music, preceding the opening of "Beyond Therapy," the first performance of the theater's 2011 season. Jen Bond Huisking, the playhouse's community relations liaison, recalled how the "Taste of Tuesday" tradition got started. "The first event of the series was in 2007, designed as an audience cultivation event," she said. "It was a way for us to build energetic audiences for the first preview play. It offered a very attractive price point for the package, allowing someone to experience the Playhouse at a reasonable cost for the first time or to allow a regular subscriber to bring friends. We definitely wanted a pre-show party but also to partner with local businesses that support our programming." Playhouse Director of Marketing David Byrd contributed additional background: "There are five plays that debut through the season, which runs April through the first week of November, and the Taste is held before each first performance," he said. "Originally the event was just value added, but then, due to its popularity, it became a subscription-only opportunity. Lucky for us and our partners, we have sold out all the `Taste of Tuesday' events for the year, capping attendance at 400 which allows us to accommodate the group easily and ensures a positive experience." Byrd said "Beyond Therapy" is a fun season starter. "By Christopher Durang, the play is a wickedly funny look at the lives of the single and those in search of relationships," he said. "Our program for the year is very eclectic and each play complements the next, hand picked by our artistic director, Mark Lamos, with our audience in mind." "Taste" is one of a series of ancillary events the playhouse hosts. Others include nights out for realtors, the gay community, ladies only, couples and young professionals. "We'll work with any group that wants to engage with us," Byrd said. Paul Teoh, co-owner of Matsu Sushi, said he was glad to support the "Taste of Tuesday" event. "We have been in Westport for eight years and gained a lot from the town," he said. "We like to support the local community and give back through events like this. We've been supporting the playhouse for the past two years." Ridgefield residents Jeanne Bodnar and Dave Walker enjoyed the soiree. "I've been a subscriber for 20 years," Bodnar said. "It's great. This is our second year doing the Taste of Tuesday. We like the mingling, you get to see a great play and the price is right." "It's a great addition," Walker said. "Jeanne won a nice piece of jewelry at one last year." "Jinah Yun, a fellow attendee from Stamford, agreed with Bodnar's assessment. "I've been a season ticket holder for two years and have been to every Taste of Tuesday in that time," she said. "We always get these tickets. The music and wine tasting is nice and many friends are here. And it's great to be one of the first to see a new show." Playhouse staffer Huisking best summed up the experience. "This is a great way to come together and celebrate live theater," he said.